Narrow gauge 47 foot flat wagon constructed by A.E. Goodwin Ltd.
20.3.1970 Entered service as narrow gauge "NRN" flat wagon. 2.1979 Converted to standard gauge, ex Central Australia Railway as "RP 2291". 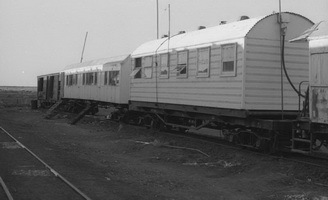 1.1980 Converted to standard gauge, ex Central Australia Railway. - To "AENY" refrigerated container wagon. 2.1979 Converted to standard gauge, ex Central Australia Railway as "RP 2294". 1999 Sold to TasRail, recoded "QLE 22". 2.1979 Converted to standard gauge, ex Central Australia Railway and recoded "RP 2296" flat wagon. 1999 Sold to TasRail, recoded "QLE 23". 1999 Sold to TasRail, recoded "QLE 24". 20.8.1970 Entered service as narrow gauge "NRN 1625" flat wagon. 12.8.1970 Entered service as narrow gauge "NRN" flat wagon. 20.8.1970 Entered service as narrow gauge "NRN" flat wagon. 10.9.1970 Entered service as narrow gauge "NRN" flat wagon. 21.8.1970 Entered service as narrow gauge "NRN" flat wagon. 11.10.1977 Transferred from North Australia Railway to Central Australia Railway. 2.9.1970 Entered service as narrow gauge "NRN" flat wagon. 14.10.1977 Transferred from North Australia Railway to Central Australia Railway. 13.1.1977 Transferred from North Australia Railway to Central Australia Railway. 28.8.1970 Entered service as narrow gauge "NRN" flat wagon. 7.8.1970 Entered service as narrow gauge "NRN" flat wagon. 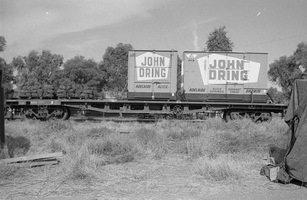 26.10.1977 Transferred from North Australia Railway to Central Australia Railway. 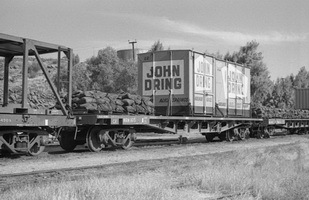 4.1977 Transferred from North Australia Railway to Central Australia Railway. 2.1979 Converted to standard gauge as "RP 3196" flat wagon. 18.9.1970 Entered service as narrow gauge "NRN" flat wagon. 3.11.1970 Entered service as narrow gauge "NRN" flat wagon. 25.11.1970 Entered service as narrow gauge "NRN" flat wagon. 31.12.1970 Entered service as narrow gauge "NRN" flat wagon. 2.10.1970 Entered service as narrow gauge "NRN" flat wagon. 11.9.1970 Entered service as narrow gauge "NRN" flat wagon. 2.1979 Converted to standard gauge as "RP 3198". Converted to "AENY" refrigerated container flat. 1999 Sold to TasRail, recoded "QLE 25". 4.1.1971 Entered service as narrow gauge "NRN" flat wagon. 16.9.1970 Entered service as narrow gauge "NRN" flat wagon. 12.11.1970 Entered service as narrow gauge "NRN" flat wagon. 2.11.1970 Entered service as narrow gauge "NRN" flat wagon.